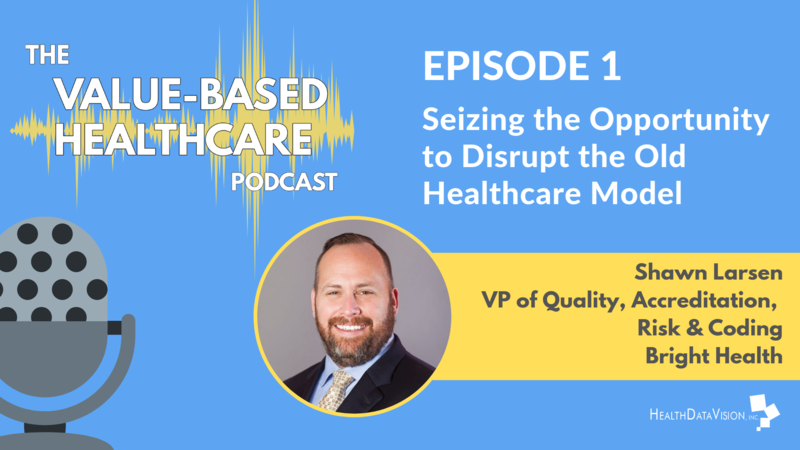 Health Data Vision, Inc. is proud to launch a new series, The Value-Based Healthcare Podcast, Our guest on this episode is Shawn Larsen, VP of Quality, Accreditation, Risk & Coding at Bright Health. This series aims to assist health plans become more successful through shared experience and best practices used by their peers in the industry. We interview executives at all levels within Risk Adjustment and Quality Improvement groups to share various perspectives. The Value-Based Healthcare Podcast is about sharing inspiring and real-world solutions from the people who are questioning the way business has always been done. We aim to educate across the spectrum of healthcare so that managed care organizations, providers and members alike are more successful in navigating and operating in this complex and ever-changing landscape. Subscribe today to ensure you receive the latest episodes! Click here or the image that follows to listen to the entire podcast. Scroll down to read the transcription. Hello and good day. I’m Jay Ackerman, CEO of Health Data Vision. We are a software and services business committed to providing health plans with innovative technologies to maximize their returns from HEDIS and risk adjustment initiatives; a must in the value-based care environment we all operate in. Today we are launching a podcast series entitled ‘Succeeding in a Value-Based Reimbursement World.’ We aim to widen the visibility and voice the people shaping significant functions inside of health plans. I'm thrilled today to be joined by Shawn Larson, VP of Quality, accreditation, risk and coding at Bright Health for our inaugural podcast. Please enjoy this podcast and feel free to share it with others and promote via social media. Now for a little about our inaugural guest. Sean has been in healthcare for 25 years. He’s been a registered nurse and credits his grandmother who was also a nurse. Over the last 15 years he’s been focused on health insurance in the areas of quality, risk adjustment, accreditation, stars and market operations. Sean joined Bright Health in 2016 to start quality, risk, accreditation and stars. He lives in Minneapolis Metro and often can be found on a weekends hiking and running. And now with that, let’s hear from Sean. Sean, let's begin with a few questions regarding your career journey. Can you share how you found your way into healthcare and then what brought you to Bright Health? Sure. So before becoming a nurse, I was an assistant in a classroom and I took care of children that had special needs and that really drove me to want to work with children in a more formal setting. So I spent much of my time in the NICU taking care of pre and post heart transplant kids after graduating nursing school. And that just kind of evolved over time and to focus on more of risk and quality. I came to Bright Health because I had been traveling pretty much the last seven years of my career and I wanted a role that could keep me at home a little more. Bright Health was just getting started, they were seeking leadership in risk and quality. After meeting with the founders and spending some time with the Bright team and looking at the culture and understanding what the vision and mission of Bright was, I just knew that it was the right fit and place for me. And a health plan like Bright that's going through a lot of growth, how do you find your role changing from day to day? That's a great question. As Bright looks to expand and looks to change and be a disrupter in the environment, my role really has not only been to be a subject matter expert in the areas that I work in, but it's also to provide leadership and stability. So when you have massive growth and when you're lucky to get a startup off the ground, consistency and ability to be pliable with the change is a really important portion of the work that our team does. Hey thanks for sharing that. I understand that as someone who's overseeing a high growth company and the need to have people who can flex and change as our needs evolve. How is it that you had become responsible for overseeing the health plans’ Initial Validation Audit (IVA)? In my previous roles I was responsible for different areas of risk adjustment and one of those areas happens to be one I was responsible for. After we got our first add submission off the ground and completed successfully, the validation audit was the next step that we had to take on. It's been a great learning experience for me and for our team, and certainly we’ve appreciated the collaboration with HDVI to make it as successful as possible. Everything we do, we do it right at the first, so we are learning as we go and then documenting the process, even fine-tuning our skill. So that was the next step we had to do in order to be a successful health plan. Great. Well, I appreciate you helping me with this podcast being our first so thanks for that. Can you share your goals related to the IVA Audit? Yeah, so we came into the IVA Audit with eyes wide open. We wanted to get 90% of our charts retrieved in a timely fashion and we wanted to ensure that we were able to at least meet a 90% threshold on our coding accuracy. Again, at a new organization we wanted to set the bar really high for ourselves. We wanted to strive for as close to perfection as we could possibly be. And now that you’re, I guess perhaps two thirds of the way through, are those two goals still of primary importance to you or has something else arisen through the process? I would say it was more of a reality check as we went through the process. And I think that it's finding the right partner like HDVI, to do the work with, integrating appropriately with our care partners where we need to retrieve the charts and information from and understanding ourselves. What are we capable of doing? Have we scaled to the right level that we need to scale to in order to be successful? And it's really about the learning right now. It’s the first time through this process, it’s been less about what does the success look like and more about learning the process, learning ourselves, and learning our business partner. Great, thanks for that. How about we shift and talk about the industry and all the change that’s unfolding.What industry trends do you see that are beneficial to Bright and your mission? You know over the past decade we’ve really seen, kind of witnessing this evolution of healthcare. The delivery, the consolidation of small independent providers into larger, more comprehensive systems. Bright has really tried to seize into this opportunity to kind of disrupt the old healthcare model. Where insurers, quite frankly, were at odds with providers at times. Instead, our model really has given us the opportunity to work directly with the care partners and offer them a completely integrated consumer healthcare experience from start to finish. We do feel like our model is kind of unique in that we're able to put our consumers first and we try to remove much of the frustration in that experience within the healthcare setting. And how are the members responding to this integrated model? You know, our membership has grown year over year. We continue to see advancements in our sales. We retain a high number of members that had purchased a plan the year before. And you know, quite frankly, on some of our surveys and information that we get back, we hear a lot of positive feedback about how easy it is to work with us, how less complex it is, how there's more focus on the relationship between the care partners position and the member than there is on the insurance company. How do these broader trends that you were just speaking about impact the organization that you're responsible for in particular? Our model really is kind of revolutionary in the healthcare industry and it centers around innovative care partner health plans. So what that means is we go into a market and we focus on a more singular care partner situation and system. So as opposed to having multiple care partners and blanketing a geographic area, we focus on one care partner, we develop a very tight relationship with that care partner. And through that we work in a more transparent type relationship. So an example of that in the process of trying to collect charts and information for both our HEDIS processes and for our risk adjustment data validation processes is when we have hiccups or issues along the way, we can pick up the phone, know that we have a point of contact, and work with that point of contact to work through any issues that we haven't tried to get resolution. It's much different than where I worked in the past and I would have to spend up to six months trying to get a meeting with somebody when the ticker is timing out. Do you find that your care partners are vocal in sharing ideas and how they'd like to see the process streamlined or the experience improved from their vantage point? Yeah, I think that's one of the best things that we offer to our care partners. We don't actually go in and say thisis the right way. When we sit down with ourcare partners and any of our teacher care partners we get through an implementation and discovery period. And that process allows us to understand how care partners function, what their idiosyncrasies are, what tried and true things they’ve already done and where they might need improvements. And so I think the ability for us to sit down, face to face with our care partners and say, ‘How would you like us to do this?’, versus ‘This is how we do this.’ has been extremely beneficial for us. I bet. What do you see as the greatest barriers or challenges that affect your success in today's environment? Great question. Consumers are really tired of the status quo in the healthcare industry and where they find themselves in fractured relationships and quite frankly, they get stuck in the middle of insurers and providers. Insurers and providers are often at odds. So figuring out how to take the highly regulated environment that we work in and make it seamless to the consumer is a large part of what we're really trying to do. Can you share an example of how you're doing that? Yeah, so, you know, let me think about that for a second and come up with a good one. I think one of the things that we work really closely with our care partners and our members on is a process of keeping numbers in network. So when you work and have an EPO, which is an exclusive provider organization, when you work with one care partner, that number is signing up into an organization that wants to keep that member inside. So the benefit of having a member receive their care in an in-network facility has really massive amounts of opportunity to prove that. So when somebody goes out-of-network, we work really hard to ensure that person can come back into the network. That collaboration between us and that care partner working on the best interest of the member has been a great experience for us and we have had great success with that. That’s great. Thanks for sharing that. How about we turn it a bit internal. And by that, I mean let’s talk about kinda what happens inside Bright. If you find yourself in an elevator with your CEO, what might you tell him or her about your business goals and priorities? You know and I often do find myself with our CEO because he sits not too far from me. We work to increase our consumer satisfaction. We really give consumers what they want from a health plan. We have predictable rates, we provide customer service, we have simple to use technology that we use. We really do try to make life easier for them and reduce that and simplify the administrative process. I think it's interesting to see that our goals are really high. So we want to be able to afford a four and a half to five-star plan. We want to have clean data going into the system. And so we've really helped to align all of our strategies together so that we're not bifurcated in multiple different silos. So one of the biggest things we do at Bright Health and one of the things that I love having a conversation with our CEO about is that risk, quality, and stars are all run under one umbrella. And that allows us to reduce friction to our care providers, reduce administrative costs, reduce redundancies, and chart chases and retrieval. So we really work hard to stay true to that streamlining approach. Excellent. So in that conversation when you’re with him, what request might you make of the CEO and his leadership team? To keep pushing the model we've created. We're just starting to really launch ourselves out there. We need to keep speaking out on being a disruptive voice in a time that desperately needs some change. Consumers need to have predictability and dependability in their care partners and in insurance plans. So we need to keep the course. Awesome. In working with the HDVI, can you share a thought or two on how this partnership is helping you achieve success? You bet. So as I said earlier, this is really the first time completing the validation audit. So we have lots of questions. We get a little nervous when we don't know if we're ‘doing it right.’ HDVI has been a fantastic partner. We spent a good amount of time prior to the audit, walking through all the steps dialoguing on how to be most successful. The HDVI team has been extremely responsive to our needs and concerns and is always ready to jump on a call and review whatever is needed to be reviewed. We’re greatly appreciative of the partnership. We know that maintaining consistent relationships with our business partners is really vital to our ongoing success. So in this environment, what characteristics do you value in considering a business partner? So I think first is honesty and integrity. There's a willingness to not say who’s right or wrong but let's just get on the phone and get this figured out. I think a clarity and tools; we want to be able to hold ourselves accountable as well as our business partners. I think transparency is really important. We want a partnership that's just that; - a partnership. Equal inputs from from both sides. In the end we understand that our success is your success. It’s a vice versa type situation. Well I appreciate you sharing those characteristics. I hope that behalf of the HDVI team, we do our best every day to live up to those. So it’s really nice to hear you articulate them. Shawn, I’ve thoroughly enjoyed our conversation today. You've been a great first guest for us with this podcast series. Thank you for taking the time out of your busy schedule to talk with meand sharing your thoughts with our listener base.As we bring this to a close, I’m hoping you’ll indulge me with five lightning round questions. Anyone on my team will share with you that this is a staple when we have internal management meetings and off-sites. We’ll move through them quick, share what's top of mind for you, no right or wrong. What what keeps you up at night? Chart chase. It’s amazing that we still have to chase charts the way that we do. And I understand that it’s the lifeblood of the work that we complete. Yeah chart chase keeps me up. That and my dogs. When it's chart chases or your dogs and when you're restless, what book might you grab from your nightstand and why are you reading it? Yeah, I grab my iPad most of the time. Currently I'm reading ‘Time, Talent, Energy, by Eric Garton. It's a great read on how to organize yourself and your team and really give things simplicity. Excellent. I haven’t read that one so I'll put that on my reading list. Alright here's one, a little deeper. If you could redo one decision in your life, what would it be and why? I would have worked harder probably in school on learning how to learn. Not content. And yes I do use algebra for anyone who says you won’t use it. But on the process of learning. I think it wasn't until later in my career that understands, how to better, how to learn and that's really made a lot of difference in my growth and advancement. You know, that's great feedback and advice. So a little lighter. What’s your favorite app on your mobile device? It’s probably fun doing them both together, right? Generally you say one, and then I have to give you two answers because I’m never doing one without the other. So yeah, Spotify and Scrabble. I play a lot of Scrabble. Alright, I’ll keep that in mind if I ever find myself stuck traveling with you. How do you invest in yourself? I do a lot of running. I’ve actually had the pleasure of being able to do running all over. I run the Disney 10K in Orlando. I did the 10-mile last year here at the Twin Cities Marathon and done a lot of 5K’s around the country. That and learning. I like to take classes just for fun. I just finished some accounting and economics classes just so I could learn a little bit more. Well that’s wonderful. Well Shawn, thanks again for your time and your openness. This brings our ‘Succeeding in a Value-Based Reimbursement World’ podcast to a close. Please follow Health Data Vision on Facebook, Twitter and LinkedIn. Or you may also follow me, Jay, on Twitter at @AckermanJay. Thank you and have a super day!